People who undergo endodontic treatments at Desert Dental Alternatives are often surprised to learn two things. First, many patients are surprised to learn that a root canal is not actually a procedure, but an anatomical structure within their mouths. Indeed, every tooth has between one and four root canals, each of which contains a nutrient-rich substance called dental pulp that is essential to the health of the tooth. When the root canal is breached, whether due to tooth decay, disease, or trauma, this dental pulp will become infected, leading to often excruciating tooth pain. 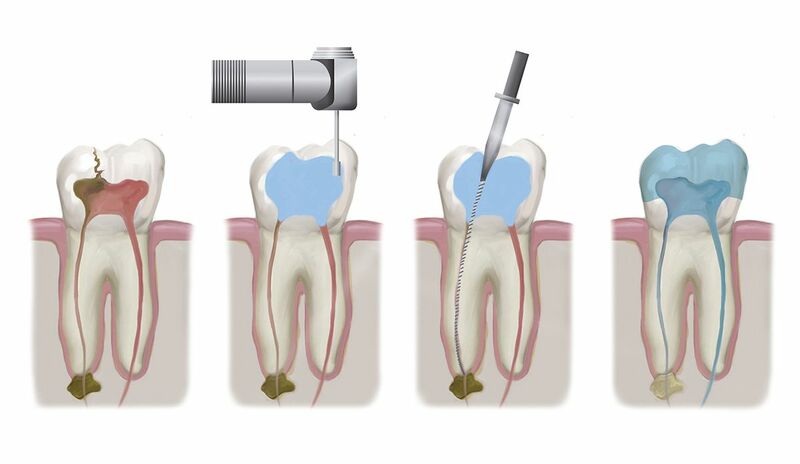 At this point, endodontic treatment - a “root canal” - becomes necessary to stop the pain and salvage the infected tooth. The second thing that surprises many of our patients is that root canal therapy is actually, contrary to its reputation, a relatively gentle, pain-free procedure. In fact, the procedure is responsible for relieving more dental pain than probably any other procedure in all of dentistry. By surgically removing the infected pulp, replacing it with a filler substance, sealing the tooth, and covering it with a dental crown, Dr. Bruno Lemay is able to restore form, function, and health to a patient’s smile. However, root canal therapy is a surgical procedure and, as such, requires a period of recovery before patients’ mouths will be fully healed. Dr. Lemay details the root canal therapy recovery process during consultations at his Rancho Mirage, Palm Springs, and Palm Desert, CA area office so that patients know precisely what to expect before undergoing treatment. If you are experiencing severe tooth pain, we urge you to schedule your consultation with Dr. Lemay today. After the numbness of your anesthetic wears off, you may feel some tenderness or even aching in the treatment area as well as your jaw. This is normal. These post-surgical symptoms can last for a few days, but they are generally easy to manage with over-the-counter pain relievers. Dr. Lemay can prescribe stronger pain medication in case your discomfort becomes intolerable, but it is a good idea to try over-the-counter medication first. Dr. Lemay will also prescribe antibiotics to prevent infection; you should take this medication precisely as recommended. It is extremely important that you do not put any pressure on your treated tooth, such as biting or chewing pressure, until it has been restored with a permanent dental crown. You should brush and floss as you normally would, at least twice a day and after each meal, immediately after your procedure. With a good oral hygiene regimen and, minimally, twice-annual trips to the dentist, your salvaged tooth can last for the rest of your life. In rare instances, further root canal therapy on an already-treated tooth becomes necessary months or even years later. In the vast majority of cases, however, this is not the case. To learn more about root canal therapy and the recovery period following surgery, please contact Desert Dental Alternatives today.